Aliasing Example Illustrates the effect of aliasing (tearing) by the coplanar overlap of two cubes with different colors. 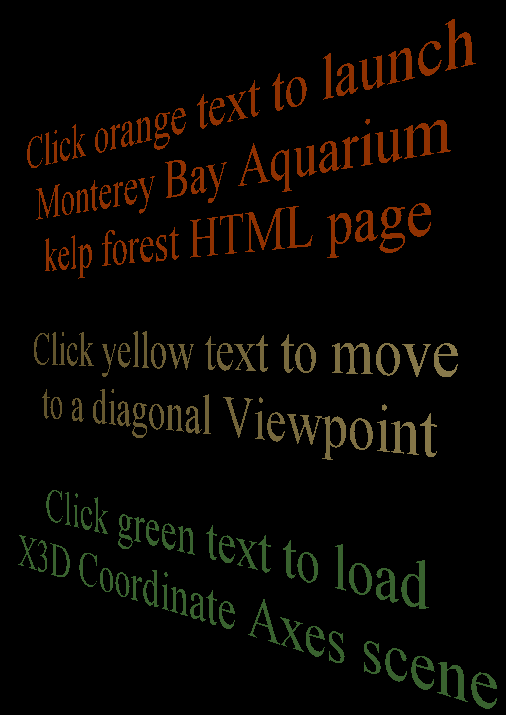 Anchor Anchor example using the Kelp Forest world. Anchor Comparison Anchor-node examples comparing HTML page launch, shifting Viewpoints, and loading another X3D scene. Billboard Illustrates Billboard operation using Kelp Forest example scenes for Figure 4.4, X3D for Web Authors. Binding Operations Illustrate Viewpoint binding operations (in gory detail!) as described in Chapter 4 concepts. Scene design: a TimeSensor clock drives and IntegerSequencer for each t0/t1/etc. event, and a customized Script node sends bind/unbind events to the correct Viewpoint. Display the browser console to see occurrence of each event. Collision Illustrate Collision node operation: set Collision enabled="true" to block user navigation through the Kelp Forest tank glass. 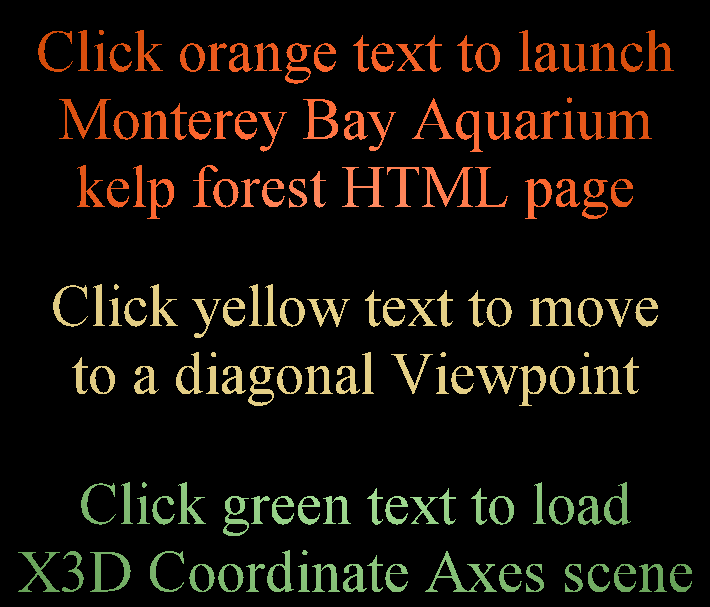 Navigation Info NavigationInfo override example for Kelp Forest world. Viewpoint Viewpoint example added to Kelp Forest world.